Lately, I’ve been thinking a bit about ignorance. As well as people’s pre-conceived opinions and ideas about others that work in certain businesses and are CEOs or cleaners or teachers or receptionists or nurses or truck drivers. Well, it’s more that I’m being slapped in the face with it everyday, as opposed to actively thinking about it in any great depth. And what I’ve discovered isn’t much of a discovery at all, but there’s certainly a lot of truth in it; a job title, in many cases, has very little to do with the intelligence level of the person bearing it. Because the truth is that some of the dumbest people walking the earth are running multi-million dollar companies. Some of the most ignorant people you will ever meet have job titles that make them sound far greater than what they could ever hope to become. And, in turn, some incredibly intelligent people don’t have a business card that backs up their brains. Some people – brimming with smarts – might not have a job description or title to match them. But it doesn’t mean they are not. It’s frustrating, if you think about it long enough. And a little disheartening. Over the past couple of months, I have seen many cases of inept leaders running businesses. People that somehow ended up in the big chair, because of sheer luck or fortune, good timing or something equally as fluky. People who just don’t get it. And who don’t have the basic skills one would assume you require to be in the position they’re in. In most cases, their businesses are a complete shambles, which makes a lot of sense because it all starts at the top – ineptitude, incapability, lack of direction – all these things filter down from the top and create the kind of workplace culture that makes people want to stab themselves in the eye with a fork in the morning instead of getting out of bed and going to work. What I’ve learnt is not to assume when it comes to job titles – so very often they indicate precisely nothing. I’m talking about CEOs that don’t know their left from their right. Teachers that can’t spell. Accountants that can’t put two and two together. And truck drivers that are also artists. Cleaners that are studying to be surgeons. Chefs that have more of an IQ than all the people dining in their restaurant put together. I’ve learnt that common sense is not an add on that comes with intelligence. Some people have it and some people do not. But mostly I’ve learnt not to underestimate someone because of the job they do. The school they went to. Or the post code they live in. I know plenty of privately educated people that cannot tell their ‘your’ from their ‘you’re’, let alone more complex and intricate details of history or science or life. But I also know private school alumni who are incredibly gifted and intelligent and doing wonderful things in the world. 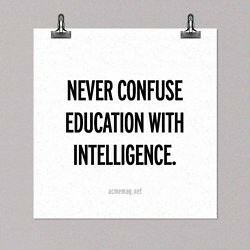 I know plenty of people that went through the public school system who are intelligent and educated and talented. I also know people that went through the public school system that cannot tell their ‘your’ from their ‘you’re’, let alone more complex and intricate details of history or science or life. The job title listed on someone’s business card is not a pass to hold them in high esteem. Hold someone in high esteem because they deserve to be – for their work, their efforts and ethics, their morals and practices – because of who they are not what they do. Don’t eliminate the possibility of knowing someone truly remarkable because you’ve placed a limitation upon them – because you’ve judged them based on what they do. There are people I am lucky to have in my life that I probably wouldn’t even know if I had of judged them based on what they do, what school they went to or where they live. There are intelligent people everywhere. They are not confined to suburbs or cities or countries. Don’t confine someone from your life because they don’t have the right type of business card. ← I’m a Guest Panelist at the Emerging Writers’ Festival! I know that I prefer passing out my personal card anytime over my professional card because I do not feel defined by my day job. Are business cards passé or the way society stereotypes our titles and schooling? I don’t think business cards are passé at all. I just believe there’s more to a person that the title on their business card – in some cases, much more, and in some cases, much less. Career snobbery is the WORST, and I have to say I am guilty of reverse snobbery. In that I am more likely to listen to the guy working at a cafe while studying his doctorate, than I am the suit who works in a bank. I couldn’t agree with you more. In fact, I’ve always made it my personal motto to be best friends with the cleaners, much to the dismay of the elite… and what I find is that they’re the most intelligent, engaging and proud people I’ve ever met.